Serendipity: making a pleasant discovery by accident. That defines Calf Creek for me. 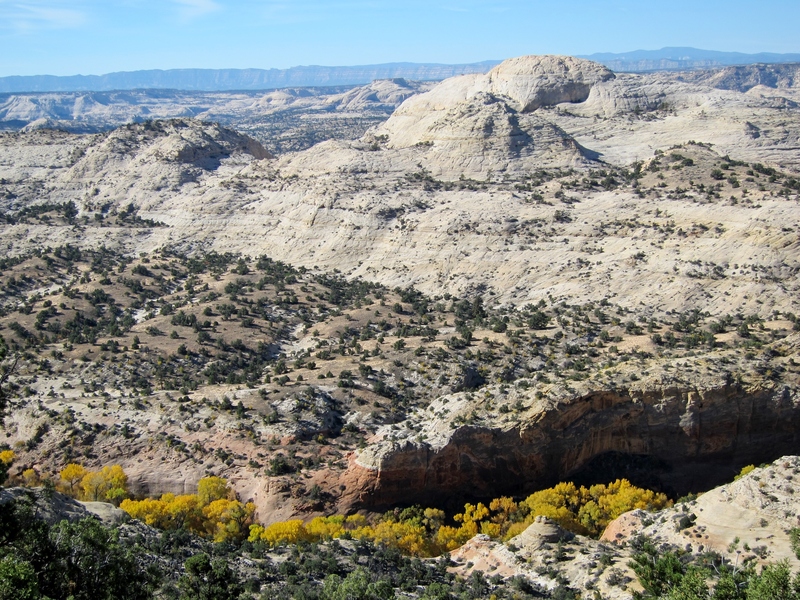 While taking the very scenic Utah state highway 12 from Torrey to Bryce Canyon, in the midst of so much wonderful high desert scenery appeared a sign, “Calf Creek Recreation Area.” Now, as you know, any sign with the word “creek” in it immediately gets my attention. Braking hard, I pulled into the parking lot and was immediately struck by the area’s beauty, especially clad, as it were, in autumn colors. 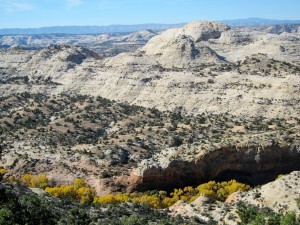 Calf Creek begins several miles upcanyon, the product of large seeps and springs. Almost impenetrable, its banks are a riot of cattail, reed, river birch, cottonwood, and willow, creating an open-sky tunnel along the stream. My wife and I rigged our rods in record time and surveyed the stream. Shy trout darted from rootwads and undercut banks at our approach, and it became immediately apparent that stealth was necessary on this water. 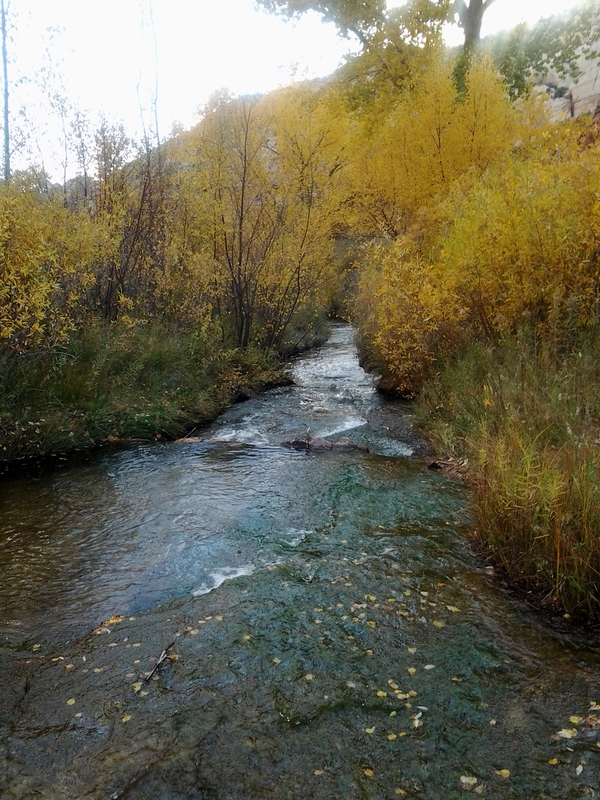 A few pools provided access from the stream’s edge, but wading directly in the creekbed proved the most feasible approach for fishing Calf Creek, casting either up or downstream. The creek has a moderate gradient, and, wet wading, the water against my legs had a pleasant insistence and coolness, given the 80-degree air temperature and full sun. Slowly, I shuffled upstream casting to the bank and boulder pockets. 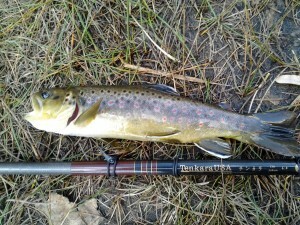 Parachute Blue Winged Olives and Elk Hair Caddis, both in sizes 16 and 18 did the trick, and that afternoon we caught many brown trout in the 8″-12″ range with some larger hooked and lost. 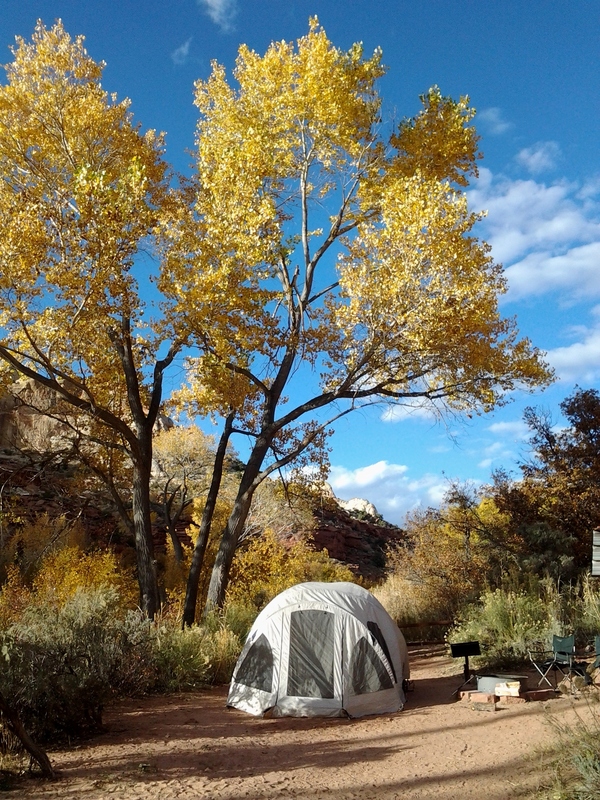 As the sunlight began to flee the canyon, we had to make a choice: pack up and drive on or stay and camp for the night in one of the dozen-or-so primitive campsites. For my wife and me, that was an easy choice. We pitched the tent on one of the nicely secluded campsites, surrounded by cottonwoods and gambel oak. Although all of the other campites were also occupied, the campground was very quiet and we almost felt alone. Dinner on the two-burner Coleman, then a campfire to ward off the high desert nighttime chill. As the conversation and fire burned to embers, my attention turned to the night sky, the stars exhilarating in this remote location in their number and brilliance. Comfortably ensconced in the tent, I burrowed into my sleeping bag, gloves and knit cap on in anticipation of a cold night. Leaving the tent in the early morning hours, I was rewarded with the sighting of a shooting star, certainly an omen of some portent. We awoke the next morning to a clear 30-degree day. 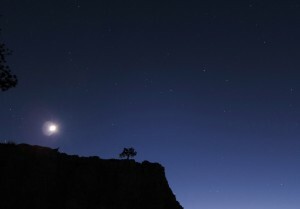 I put on my hiking boots, first shaking them out, just to be sure no scorpions had taken refuge in them overnight. The sun was just beginning to paint the upper reaches of the canyon. The warmth of another fire thawed our chilled limbs. 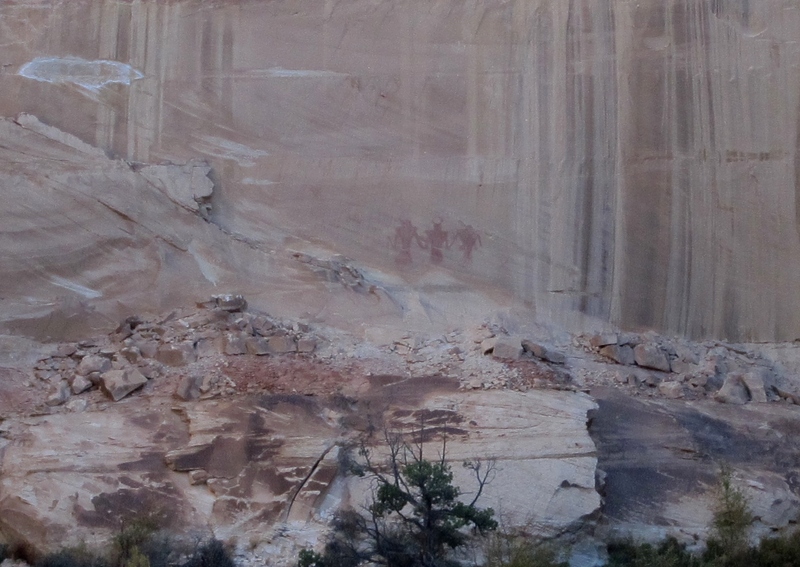 We had agreed to hike the Calf Creek Falls trail, beginning before breakfast, knowing that as soon as the sun penetrated the canyon, the day would warm quickly. This is a six-mile round-trip path to a 126-foot waterfall. We agreed in advance to hike about halfway to the falls, a six-mile strenuous hike probably pushing the limits of our abilities, and we wanted to get back on Calf Creek for another day of angling. The trail was steep and rocky, gradually climbing above the creek but the rush of water never out of earshot. In a couple of places, beavers had dammed the flow to create large stillwater ponds. 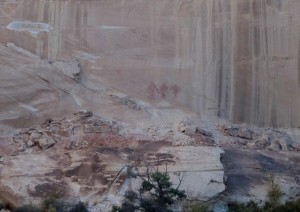 Eventually we came to ancient pictographs drawn centuries ago in red ochre, like dried blood, by the Fremont people who once inhabited this canyon. for we could hear his nightsong. Retracing our steps, we backtracked to the trailhead, the day now very warm, our fleece tied around our waists. Stopping to regain my wind, I crushed a bit of sage between my fingers and inhaled the intoxicating scent. Sage, I think, is one of those elementally appealing odors like woodsmoke or pine. After a couple hours’ fishing, more browns brought to hand, we reluctantly broke camp and continued our drive to our next destination. There are events, people, and places in one’s life that, for reasons not always completely understood, resonate in a special way, becoming a touchstone, a well of good feeling, that can be accessed again and again. Calf Creek will remain that for us.